Freelance journalist, Anna Morris, is struggling to make a name for herself, so she’s delighted to attend a launch event for a hip young artist at her friend Seb’s gallery. Seb is intent on convincing Anna that Darrick is up to no good but, try as she might, she can’t seem to keep away from him. And as she becomes further embroiled, Anna begins to wonder – can Seb’s behaviour be explained away as the well-intentioned concern of an old friend, or does he have something to hide?" The first two thirds of this book is a gentle but interesting ride in which Clare Chase draws you in, but it cannot prepare you for the wild roller coaster that follows. Following a build up which will have you questioning everyone, You Think You Know Me transforms into a gripping page turner and I did not come close to guessing the outcome until it was thrust upon me. As the "baddie" was revealed, I gasped and as the climax developed, I could feel my heart thudding in my chest and I sat holding my breath as I turned the pages as quickly as I could thinking "this cannot be happening". I was disappointed once the ending came, but only because I had become so embroiled in the story that my brain, and my heart, was longing for more. 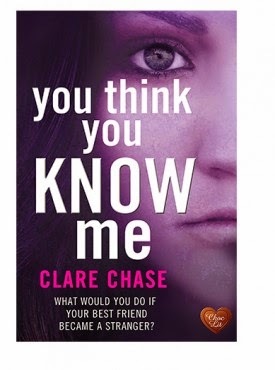 The character portrayals in You Think You Know Me are excellent and combined with the fabulous storyline, it make this an incredible debut from Clare Chase. You can always rely on Choc Lit to deliver the absolute best authors and they have not failed to deliver, once again, on this occasion. You Think You Know Me is chick lit with a razor sharp edge. You Think You Know Me is available as an ebook now and will be released in paperback in September.